1.) Can you speak a little bit about your upbringing? How did your childhood and formative years in Rhode Island affect you creatively? My upbringing was pretty ordinary. I grew up in the middle of the middle class, and in the center of the suburbs. Sometime in fifth grade, I did a school project in which I put some drawings. The teacher showed interest, so I stuck with it. My parents were supportive in that they didn’t discourage my art making. As my art interests grew, they were great about taking me the Norman Rockwell Museum and to other places. My parents weren’t the spark, but they provided oxygen. 2.) How has your art evolved from your student years until now? Have the creative breakthroughs and plateaus changed over the years? Things have changed a great deal, and yet, not much at all. I wanted to be a cartoonist as a kid. I wanted to draw funny looking things – entertaining things. In essence, I still do that. Actually, if there’s something that’s constant, it’s caricature. That is, I love playing with form and recognition in my work. By my observation, art’s a journey, but it’s a pretty cyclical one. You come around to the same things a lot. It’s like, you spiral up. My kid drawings were really cartoony. Then, in art school, my world was turned upside down. First, I learned that my work was really derivative. I was just making drawings of other drawings. I was regurgitating images that weren’t even good. I was forced to start taking ownership of my work. That was really difficult and resulted in my trying lots and lots of approaches and making lots of crap. While struggling with how to work, another class, with a very intellectual professor, helped me to see how important concepts are. Art is a vehicle for ideas, and I had pretty poor ones. I had a long way to go. That left me midway through college struggling with both my form and my content – my style and my substance. It was a point of crisis. Soon after, at an eye doctor’s appointment, I found out I was colorblind. That was another gut punch. I thought about whether I should continue in art school, but not for long. I had no better plan. So, I got back to work. (Colorblindness is pretty common in men – about 10% have it. And, it doesn’t mean you don’t see color. Rather, it means you can have trouble distinguishing between colors well.) In time, I realized that my improving concepts were the ticket to possible success. They led me forward. With work, I overcame my limitations and graduated with a scholarship award. Professionally, I cycled through a lot of the same issues as in art school. I became a freelance illustrator, and got jobs, but in time, lost my individuality. I paid too much attention to other illustrators. That led me to make imitative work and having an uncentered vision. Again, concepts rescued me. My ability to develop effective and useful images kept me busy. That was how I paid the bills. I love: caricature. That’s the cycle. That’s what happened with my newest work, as well. About a decade ago, I got the opportunity to teach in Italy. So, I decided that I’d start working in the great outdoors, just like hundreds of years of artists had done before me. I was getting sick of always working in the studio, so I started taking on the world as it is. I made Italy my studio. And do you know what happened? Exactly what happened before. I started a new bunch of drawings that were inspired by my heroes and after a couple of years, and after a lot of drawings, the work cycled back to my own sensibilities – my own enthusiasms. My landscape drawings started to take on the qualities of my still-life paintings of coffee cups. That is: caricature. That’s the moral of the story: Style is something that’s in you. Alfred Hitchcock said “style is self-plagiarism” and I can relate to that. Your work is what you can’t help but do. You need to push it. You need to develop it. But in the end, it’s a reflection of your innate sensibilities and your enthusiasms. The search in art is to find ourselves. 3.) As you began to transition from the world of freelance illustration to teaching what was your "Eureka" or "Ah-ha" moment? When did you know teaching was right for you and that you could make an impact on the lives of young artists? Like many artists, I’m really an introvert. I can work alone for hours and hours without missing a soul. And yet, when I got out of school, I immediately got enough work to keep me in the studio for weeks. After a couple of years doing that, I starting thinking I needed to do more outside of the house! Teaching seemed like a potentially good fit. I was always a student of work far beyond what I alone was making. Plus, I’m the son of a teacher, the grandson of a teacher, and the great-grandson of a teacher. Maybe teaching chose me, more than I chose it. I started as a continuing education teacher, which was really challenging. Soon after, I got a lucky break, and a former professor at RISD asked me to fill in for a class that had lost its teacher for a semester. I did well and they asked me back. The rest is history. I went from part-time instructor to full-time professor eventually. Teaching is my life, now, and has been for a long time. I’m endlessly enthusiastic and impressed by my students. Helping a student make a breakthrough is as good as it gets, as far as I’m concerned. 4.) What are the most rewarding and equally frustrating parts of teaching? Give us the highest highs and lowest lows of your career as an educator and what keeps you level while on the roller coaster. The best and worst of teaching is the students. In order for a class to work, you need an atmosphere of curiosity and a culture of effort. A teacher can’t bring all of that. If a majority of the students don’t push, the class can’t go very far. It’s a partnership. Show me an appreciative ex-student, and I’ll think about their classmates. The group dynamic is the key. The fact that a teacher can’t do it alone is both humbling and frustrating. But there’s a lesson there: always surround yourselves with motivated people. 5.) What does "cursed by enthusiasm" mean to you? As mentioned above, when younger, I was so excited by certain other artist’s work that I had trouble developing my own. I needed to learn to trust my instincts and come to realize that the work that I will do - should do, is pretty particular. I had to find myself. So, for me, paradoxically, while I’m very knowledgeable of a broad range of ways to succeed (and teach them to others), my own artistic success will be personal and unique. I can only do what I do, and try to make it better and better. 6.) Freelancing and teaching can be a grind, have you ever had thoughts of quitting the art hustle, and if so, what has kept you going? Was there any other direction you might have explored or still want to try? Teaching knocked me off the spinning wheel of freelance that I had been on for fifteen years. It provided balance to my life. Like a lot of people, I now have a number of jobs all at once. I have ex-students who have gone on to many interesting jobs, including ones in which there is no art making at all. Whenever I ask those students if studying art was a mistake, they say, “No way!” “I would never be the creative, problem-solving, self-starting person that I am today.” “I’m an artist or designer who does this now.” As for my future? I guess I should get going on writing a book. I need to get all I’ve learned written down. 7.) 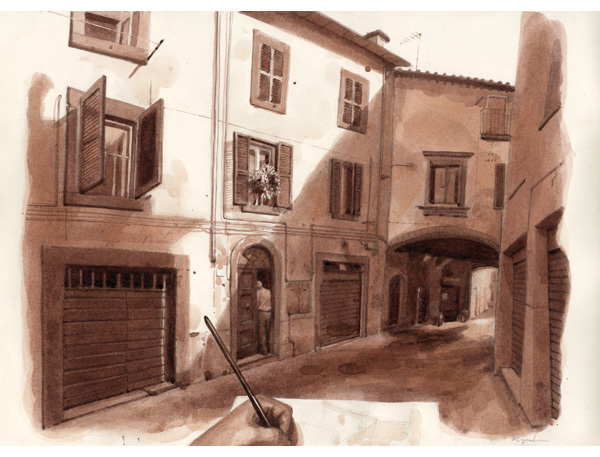 Urban sketching has become a real focus in your personal work. This is a new direction for you that's taken you all over Italy, and soon London, capturing your surroundings. Has the traveling inspired the desire to start this new “documentation” or the other way around? Has the desire to document the buildings, architecture and landscapes inspired you to start traveling more and more? I don’t like traveling as much as I like having traveled. I’m not very adventurous, really.But, when I get back from drawing somewhere, I find that my perceptions have been changed and that I’ve come to better understand my own life, and place. I’m amazed at how I hit the UrbanSketchers thing just right. My interests matched this explosion of worldwide sketch-sharing. What interests me most about the on-site work, is the challenge of documenting a real moment. I gave a talk in Barcelona entitled “Had ToBe There” and that’s exactly the motivation. To capture your own experience, rather than making up fiction, is really interesting. So is having the world as your studio and drawing with all of your senses. I sit, and listen, and draw for hours, with the world as a kind of stage before me. 8.) Your media of late, while sketching has been a nice sepia tone ink, handled like watercolor. What is your range of supplies sketching on location? Is there much you carry with you? Give us the goods right down to the brand name. I mentioned earlier that I’m color blind and that’s probably the reason why I sketch in monotone. Color is too hard for me to get on the first, second or third try. That and art history led me to brown ink. It’s a long tradition. I have a messenger bag and a collapsible stool that I take with me when I go sketching. The stool is by WalkStool, and it’s worth every penny. In my bag is a bunch of nice watercolor brushes (Winsor & Newton), mechanical pencils (Pentel), and erasers (MonoZero by Tombow and Prismacolor kneaded) and of course, ink (Winsor & Newton). I used to draw in sketchbooks (Moleskin and Stillman & Birn) but now, I tend to work with either a watercolor block (Arches 140lb hot press) and on cut sheets of heavy (300lb) Arches watercolor paper. I like sheets more than books now, so I can exhibit the works. There are other things to bring sketching that are important too. Like a water bottle, sunblock and hat. A rag is important, too. Oh, and I always bring my camera. Photos help me finish a drawing if I need to, or touch one up if I want to. This does put me on the spot. But, it’s such a good question! I’ve had the great fortune of teaching at two really special schools which have pretty different cultures. What made it easy for me to shift between the two, was that the illustration departments are very similar. That’s probably because the founder of Montserrat’s department came from RISD. She (Elissa Della-Piana) built the bridge. The differences were outside the classroom, generally. RISD is a big, competitive school of design and Montserrat is a small, informal, college of art. The curriculums and attitudes match those cultures. RISD separates its students into majors, and they seldom take classes in other departments. Whereas Montserrat integrates its students, and they take lots of classes from fine artists. I see advantages and disadvantages of both practices: depth vs breadth of knowledge, and consistency vs contradiction. Montserrat made me a better teacher because the much smaller school demanded more of me as a teacher, mentor, and advocate for my students. There are very few students that I can’t remember from all those years of teaching in Beverly. At RISD, I play a smaller role on a bigger team. There are lots of students that I’ve never even met, never-mind taught. However, RISD made me a better professor by forcing me to engage with the bigger world. It’s very important to them that I do much more than just teach in a classroom. 10.) Okay… softball pitch here, we’re switching gears; If you could have one “super power” what would it be? Yes. Aren’t you glad you asked? For those who don’t know me, I’ve been dedicated to being the last person on earth to have a cell phone, and I was doing pretty well with that goal, until, I had a health scare recently and ended up in the emergency room. It was nothing - a complete false alarm, but, I freaked people out by not being able to communicate with them. I learned the difference between being unable and unwilling to be connected with someone. So, now I have a cell phone. I’m now able to connect, but still unwilling. My cell phone sits in a pocket of my briefcase, off, and completely unused. For me, I need to avoid interruption and unnecessary attachments. Nothing is more interruptive than a phone. And, from what I can tell, causes more unnecessary attachments. I should add, I’m not a luddite. I love my computer and the internet. 11). If current day Fred could give yesteryear Fred one bit of advice, what would that be? I’m slow to embrace change, and that gets in my way, sometimes. For instance, my digital skills are minimal. I should have invested the time to learning more basic technologies, It would have saved me so much time in the long run and opened up possibilities with my work. 12.) Before we let you go, one thing we always like to ask from artists (and especially educators) we’re sitting down with is; who or what should we be on the look out for? Give us an artist out there that you think our readers need to stop what they are doing and look up right now. I’d say Christoph Neimann. He’s a German illustrator living in New York. He’s really bright and full of fun ideas. He’s also pushing boundaries in the illustration field, experimenting with interaction and movement. 13.) Lastly, describe Fred Lynch in one word. No pressure.